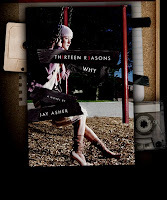 Want to get the scoop on the NYT bestseller 13 REASONS WHY? Discuss the book, the path to publication, and the aftermath of success with the author himself. Jay Asher (a.k.a. Disco Mermaid) will be chatting live at the readergirlz forum today, Thursday, July 24th, at 6 PM PST/9 PM EST. The chat will last for about an hour, and you don't even need to have read the book to join in. Check out the latest readergirlz issue, and we'll see you at the forum!